RETAIL VALUE OF $29,560+TAXES! LIKE NEW, NEVER ACCIDENTED, LOW CERTIFIED KILOMETERS. IN SERVICE DATE JUNE 2018 WITH A BALANCE OF COMPREHENSIVE AND POWERTRAIN WARRANTIES. EXTENDED WARRANTY AVAILABLE, DETAILS IN STORE. WINTER TIRES AVAILABLE. 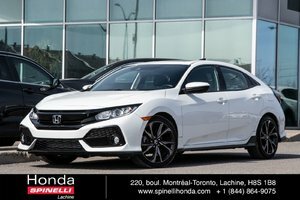 SPORT (HATCHBACK) MODEL WITH 1.5L TURBO ENGINE AND HONDA SENSING! Cylinders : 4 Cylinder Engine 1.5L - 4 cyl.